The following appears in the most recent edition of the Journal of Broadcasting and Electronic Media. BOOK REVIEW OF: boyd, d. (2014). It’s complicated: The social lives of networked teens. New Haven, CT: Yale University Press. 271 pages. When I was a senior in high school, I joined America Online, which was, for many of my generation, our first real taste of the Internet. I often chatted with friends through instant messenger, but I also spent many late nights exploring the topic-specific chat rooms talking with people who shared similar interests. Most importantly, I used AOL to locate and introduce myself to current and fellow incoming students at my future college, gaining both friends and valuable information before I ever stepped foot on campus. 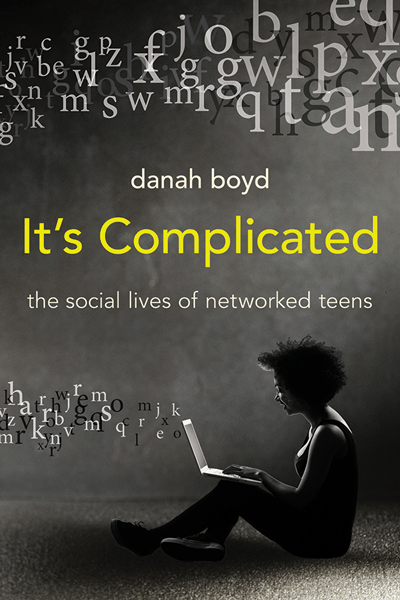 Even though my introduction to mediated social interactions occurred more than a decade before the interviews highlighted in danah boyd’s new book, It’s complicated: The social lives of networked teens, I found myself easily identifying with the perspectives and experiences these teens shared as they navigated identity, privacy, and relationships via technology. In many ways, not much has changed: teens today face many of the same challenges growing up that their parents and grandparents did. At the same time, however, the evolution of the Web and increasing ubiquity of mobile phones has increased parents’ and lawmakers’ focus on the safety and privacy of the youngest—and presumably most vulnerable—users. And as we have seen throughout history, new technologies are often accompanied by new fears, especially when they are not well understood. Boyd challenges readers—and especially parents of adolescents—to put fear aside for a moment and consider why young people are engaging with these technologies. For most teens, social media and smartphones serve a critical relationship maintenance function. As boyd notes, “Most teens are not compelled by gadgetry as such—they are compelled by friendship. The gadgets are interesting to them primarily as a means to a social end” (p. 18). She supports her argument with more than a decade of ethnographic work talking to teens, parents, teachers, and other adults working with youth, as well as 166 formal interviews with teens around the country. Boyd’s passion for the topic is evident on every page and in every description of an interview subject. It quickly becomes clear to anyone reading the book that boyd is deeply invested in getting teens’ perspectives on technology and sociality “right”—when popular media have so often gotten the story wrong. Boyd tackles a range of issues, including addiction, “stranger danger,” cyberbullying, socioeconomic inequalities, and digital literacy. Throughout, she highlights the inherent tension between privacy and publicity, diving deeply into the personal narratives of the teens she talked to during the height of MySpace and Facebook’s popularity among this population. It is here, within these anecdotes, that we hear the stories not covered by media. For example, sisters Ashley and Alice described very different relationships with each other and their parents; the discussion highlights how parents and teens can frame conflict in significantly different ways (bullying vs. “drama”) (pp. 129-130). Likewise, while Tara’s use of social media may seem like an “addiction” to outsiders, she views it as “a social necessity” (p. 84) to keep in touch with friends because her parents restrict her free time. “The notion of digital natives…obscures the uneven distribution of technological skills and media literacy across the youth population, presenting an inaccurate portrait of young people as uniformly prepared for the digital era and ignoring the assumed level of privilege required to be “native” (pp. 179-180). As with all of boyd’s writings, I thoroughly enjoyed this book. The book will provide a quick read for anyone interested in the social impacts of communication technologies. She is adept at transforming sometimes-complex concepts into clear and accessible passages and has a gift for telling a strong narrative. If anything, I was disappointed by the amount of content in her book that I have read before in other venues, as this book covers 10 years of data collection and many of the topics have been covered in previous publications. On a more minor note, I felt myself wanting to see her reflect a more deeply on her findings at times and tie them back to theory, even though I recognize the strength of her work is in the personal stories of her participants. This book is a must-read for parents trying to understand and navigate the many communication technologies available to and being used by their children, if for no other reason than to calm a pounding heart. More importantly, this book can help parents educate themselves about the real threats their children may face when navigating social applications and those that are imagined or exaggerated in media or urban legend. As boyd astutely notes, there are a lot of misconceptions about social media use and misuse, as well as a gap between what parents think their children do on these sites and the purposes for which they actually use them (pp. 84-85). Therefore, by educating themselves about teens and social media, parents can open a line of communication with their children about responsible use of technology. Yesterday, I shared a takedown notice I received from WordPress (who had been contacted by Elsevier) for a paper I posted on the Papers section of my website. The pdf was the final version of the paper, violating the publishing contract I had signed with Elsevier before publishing the paper. I removed the pdf and replaced it with a pre-press version. My reason for complying with the takedown notice was largely motivated by the fact that (1) I did sign a contract and (2) I am still able to share my research as long as I do not post the final, paginated versions. A number of people have told me (primarily through tweets) that they disagree with my stance of “caving” to Elsevier. I understand the righteous anger people feel toward Elsevier and other publishing giants–Elsevier’s 2012 profits exceeded £2.063 billion (see page 12 of their annual report). The products on which they largely generate revenue are “free”–the researchers who submit and publish their manuscripts are not compensated, nor are the reviewers who spend an often significant amount of time working to improve the quality of the research. That said, if I have signed a contract, I believe I should honor it. Going forward, I may change my behaviors (and I will discuss this below), but I cannot change my past behavior or alter the contracts I have already signed. One person who I interacted with through Twitter yesterday (@Protohedgehog) shared this article with me, and I generally agree with the sentiments shared in it: signing a contract with a publisher clearly transfers ownership to the publisher and most contracts clearly outline what versions you can use and share for your personal use. In most instances, you are allowed to post pre-print versions on your personal websites (see Elsevier’s policy), which is what I have done on my site. While there have been instances in which I or my coauthors have been inconvenienced in having to reformat a paper for posting online, there have generally been few issues with ensuring we are able to share our research with as wide an audience as possible. One of my colleagues today approached me and said he disagreed with my post and that he posts the final versions of his papers as an act of “civil disobedience.” Again, while I share others’ disagreement with many of Elsevier’s policies, when I asked him how he would respond to a takedown notice (assuming he had signed a contract saying he would not publish the final version), he was less than confident. For myself, I do not want to risk a RIAA-style witch-hunt (for a refresher, see this post by the Electronic Freedom Foundation). Oren (@OrenTsur) noted that people in this position can still choose to not review for Elsevier journals, even if they cannot participate in a full boycott such as the Cost of Knowledge boycott (which has more than 14,000 signatures). There is a significant moral dilemma here. On one hand, young researchers who still feel compelled to publish in these venues could start to get inferior reviews; this is contrary to my belief in my role as an academic involved in academic publishing, i.e., that we must strive to improve the quality of academic work by imparting/sharing our knowledge. On the other hand, refusing to review for these companies implicitly says that we will not stand for their practices. Which stance is better? The Cost of Knowledge boycott raises several other issues with these publishers, namely the high subscription charges, which are becoming increasingly burdensome to university libraries, as well as lack of access (without paying a ridiculously high fee) to individuals who do not have institutional access. If you are not familiar with these, you may want to read up on them. Here are some examples of articles on the boycott. Someone from Elsevier responded to my tweet with a link to Elsevier’s official comment on takedown notices and their options for hosting content. They stressed their open access policies, which for final versions run from $500-$5000. These policies are pretty standard, and I have only ever heard of a one academic paying the fee. Many academics are pushing for more open access issues within journals that are generally behind paywalls. For example, Zizi Papacharissi, editor of the Journal of Broadcasting and Electronic Journalism, opened the final issue of 2012 for one year (I know this because I have an article published in the issue). There are also highly ranked journals that are fully open access (the Journal of Computer-Mediated Communication is an example), but these are few and far between. Discovering opportunities that allow researchers to make their research available in high quality journals without placing a cost burden on them should be a priority. These are some of the issues that make up part of the current debate. There are more that I haven’t touched on. I encourage readers to add their thoughts and comments below. Update [12/12, 1:40pm]: I have written a more in-depth post on the take-down and my thoughts on this issue here. In the last couple days, news has been spreading of Academia.edu receiving takedown notices from Elsevier and notifying users that it is automatically complying with requests from the publishing giant by removing content without the user’s authorization (see this story by Venturebeat). This has certainly caused a lot of talk in academic circles about academic publishing rights, open access, chilling effects on sharing research, etc. I have additional news to contribute to this conversation that I have kept to myself until now, but is probably important for academics to know and, if necessary, take action on, to avoid similar problems. Elsevier has not limited itself to Academia. It’s looking elsewhere, including personal blogs. And I received a DMCA takedown notice from WordPress (who was contacted by Elsevier) on November 22. See a copy of the takedown here (with identifying information removed). I take full responsibility for the takedown request. When we publish papers in journals, we sign contracts that designate what we can and cannot do with the content. I am a firm believer in sharing my research with the world, but I try to always share pre-press versions to be in line with these agreements. In this case (as the takedown notice was for a single paper), I accidentally uploaded the wrong version. I removed it immediately. I encourage all my academic friends out there to review the content they have published online and make sure it complies with whatever publishing guidelines are specified for the given journal. While I believe in open access, openly defying a giant like Elsevier by publishing final versions of papers from their journals will get you nowhere. And it is clear that they are actively searching for people in violation of the terms of agreement for publishing.